Volunteers - MAKE KIDS SMILE, INC. 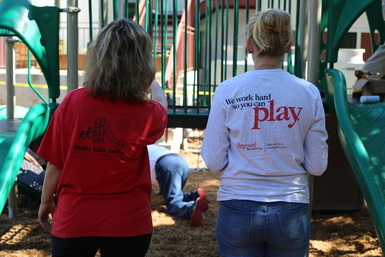 Thank you for your willingness to volunteer and assist in building a safe and secure playground for children. Following is a brief description of the tasks we will ask our volunteers to perform. Team Leaders: Responsible for leading a small group of people to assemble a playground component. All these parts will be pre-sorted and will come with instructions for assembly. It will be your job to read the instructions and supervise the assembly of the component. Those people who find it easy and satisfying assembling products such as computers, furniture kits and bicycles would like this job. Assembly of most components is not complex. For example, a crawl tube may need to be bolted together and adhered to a side panel on the playground. Once the assembly of the component is complete, you will wait until the playground coordinator is ready for that component to be installed. In the meantime, you and your team can be volunteering for the other activities listed below. Assemblers: Will report to a team leader and help assemble a playground component. Hole Diggers: Holes will need to be dug in certain areas around the playground to provide “footers” for certain components, such as slides and stairs. Pre-dug holes may also need to be widened or lengthened. Only people that are physically up to this challenge should perform these tasks. The playground coordinator will advise where these holes should be dug and will provide the appropriate dimensions. Cement Mixers: Many bags of cement will need to be mixed for the playground posts and footers. Only people that are physically up to this challenge should perform these tasks. The playground coordinator will advise when these bags of cement should be mixed, the appropriate consistency of the mixture (“wet” or “dry”) and will direct where they should be poured. Mulch or Fibar Spreaders: A large pile of mulch or fibar will need to be brought into the site for spreading. This job requires the most volunteers. The mulch or fibar can be raked or shoveled onto tarps and then can be dragged into the site for spreading. Only people that are physically up to this challenge should perform these tasks. Normally, the mulch or fibar can be piled around the perimeter of the site while the playground is being assembled. Once the playground is built, the mulch or fibar can be spread completely. Child Minders: Local kids will be excited about the project and will want to help. While we have tasks that older children can do, we will need volunteers to channel the energy of the littler ones and keep them at a safe distance from the site. Paper and markers will be provided for the children to prepare thank you drawings and letters to our volunteers. Leading simple games like Tag, Duck Duck Goose, and Simon Says is another way you can help. Tools: All tools will be provided. What to Wear: Wear clothing that is weather forecast-compatible and appropriate for a construction site. We can provide you with work gloves. It is best to wear construction boots or high-top hiking boots that you won't mind getting dirty, but plenty of volunteers wear sneakers. We ask all our volunteers to drink plenty of water and not over-exert themselves. Please take breaks when needed. Want to volunteer? Sign up for our mailing list.